Russ’s article The Plug-Ins I reach For When Mixing In Pro Tools and Mike’s follow up 10 Plug-Ins I Reach For In Post Production Work prompted responses from other members of the team. Like many I compiled a list, mine is an excellent illustration if one were needed that different users have different priorities and there is no such thing as “best” only “best for me”. It is in the nature of my work that I use many different Pro Tools systems. When selecting a plug-in I usually have in mind the possibility that I may want to open this session on another system and as a result unless there is a really good reason to favour a third party plug-in I’ll usually stick with choices from Avid. 90% of the time the advantage of compatibility outweighs the sonic differences between plug-ins. That being said some plug-ins are just plain awesome and I have to deal with that. Here are my 10. 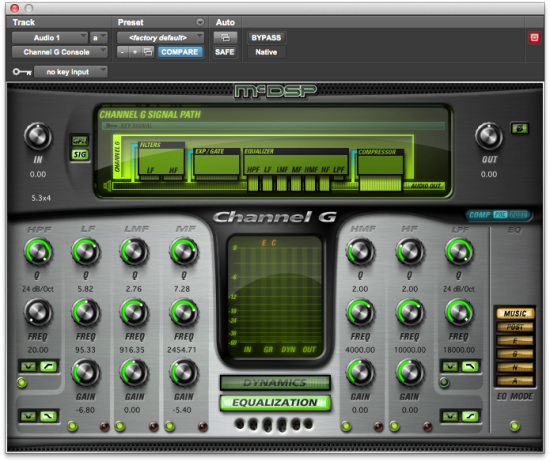 I really like McDSP stuff and of the FilterBank plug-ins the F202 is the one I use more than any other. The reason is that I find I use a high pass filter with a little boost just above the corner frequency incredibly frequently. Effectively this is a resonant high pass filter but with most EQ plug-ins you need to set up the high pass and the boost on separate bands which makes it difficult to adjust both the cut and the boost together. The peak control on F202 solves this neatly. I still come back to EQIII using it in preference to FilterBank for general EQ duties. The reason is the band-pass mode accessible using cntrl+shift and a frequency or Q control. I find this indispensable when finding problem frequencies and definitely preferable to sweeping a narrow boost in other EQs. I also find the lack of 6dB/Oct filters in EQs like Channel Strip a real oversight as it is a slope I use regularly (thankfully F202 also has 6dB filters). 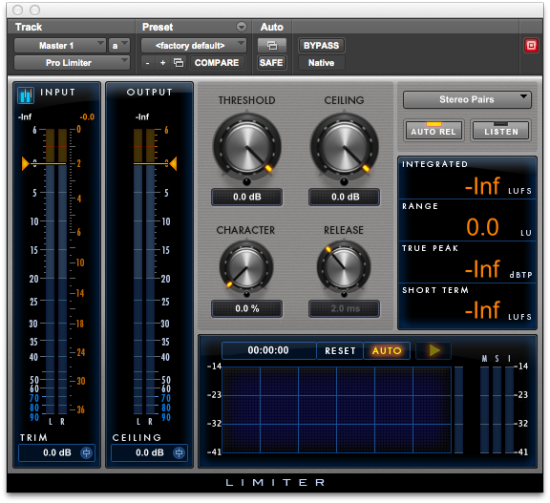 Pro Limiter is now my go to look-ahead limiter. I tend to be as gentle as I can with limiting so I don’t want to hear a “sound” and with this I don’t. However the really interesting parts for me are the AudioSuite loudness analyser, the metering and the use of the R128 standard. This plug-in prompted me to learn about LUFS and that has to be a good thing. I never got on with the stock Compressor/Limiter III in Pro Tools. I liked the sound and response of Channel Strip but my many other objections to that plug-in are well documented in my Channel Strips - Help Or Hindrance articles. The Pro Compressor offers that improved compressor with extras in the individual plug-in format I prefer. My personal fave in this plug-in is the solo button (speaker icon, to the left of ratio) If you haven’t investigated it you really should. I prefer algorithmic reverb to convolution and this one sounds great. While I value simplicity in most plug-ins, reverbs are an exception. I was wondering why this is and I think its because reverb is one of the categories of plug-in that I am happy to use presets for. If I am happy to use someone else’s starting point then I usually won’t have to worry about most of the individual settings but having access to each parameter is valuable and importantly doesn’t get in the way most of the time. Revibe is a DSP hog but if you are using send-return loops you shouldn’t have many instances running in a typical session anyway. UBK-1 is a brute and as such doesn’t get used often, I find I always go too far, its like a two-stroke motorbike - only happy when driven hard, relentlessly trying to get me into trouble. I think this uncontrollable character is acknowledged in all the opportunities for parallel processing it presents. The release of the AAX64 version has introduced proper gain reduction metering in HD11 using the channel GR meters. The metering in the plug-in was woeful by design (“use your ears” was the advice in the excellent video manual). This plug-in is so different to any other plug-in I have that in some strange way I think of it as hardware. I’m lucky enough to have access to a D Control and this plug-in was designed to mirror the EQ and Dynamics section of an ICON control surface. For that reason and that reason alone I use it but coincidentally it also happens to sound excellent. I am relatively new to this plug-in but it sounds excellent, it’s capable of both subtle and obvious effects and the grouping features make it unobtrusive in your workflow. The ganging together of the input and output controls so that moving one results in an opposite movement in the other giving automatic makeup gain is welcome and I would love to see this written into BF76’s input and output controls. I have an old version of the Waves SSL bundle which I was really excited about at the time but I never really used much apart from the SSL buss compressor. I use a real one a lot and while it is in no way as magical as some parts of the web would suggest, it is a useful, transparent buss compressor. I haven’t updated the Waves compressor since getting Impact as I find it just as useful and have used it in preference to a real one on many occasions. Not because it was better but because it was just as good. Runner up - Avid Phase Scope. If it were available in Pro Tools 11 this would have made the list as I used to use it so often. You can read about one of the uses I put it to in this article about Using Phasescope To Match Levels.